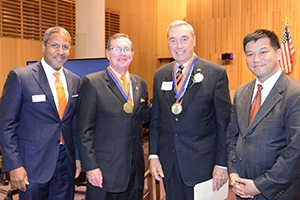 The Syracuse Law Honors are awards presented on behalf of the Syracuse University Law Alumni Association (SULAA) and the College of Law to celebrate the distinguished achievements in any field of endeavor by members of the Syracuse Law family–alumni, current and former faculty and staff, students, parents and friends–for service ‎to the College of Law, the legal profession, Syracuse University, or the world ‎at large. Please consider nominating someone today! 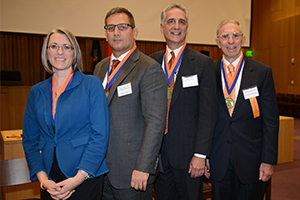 The nomination deadline for the 2019 Syracuse Law Honors is May 15. Nominations are reviewed by SULAA, and at their recommendation, honorees are selected by the Dean and the SULAA Board of Directors. 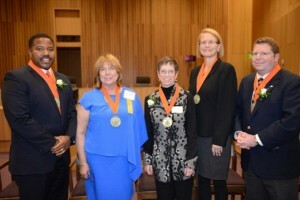 Recipients of the award are honored at an awards ceremony during the College of Law's Syracuse Law Alumni Weekend each fall, and will also be invited to interact with students, faculty, and friends of the College in classes, lectures or symposia in connection with the weekend. Professor Emeritus Travis H.D. Lewin, for his leadership and unparalleled support of the College’s advocacy programs. Dr. Natasha James-Waldon L'94, for her tireless work promoting social justice and advancing anti-poverty programs. On behalf of Board of Directors of SULAA, thank you for your time, thought and consideration, and support of Syracuse University College of Law and SULAA.